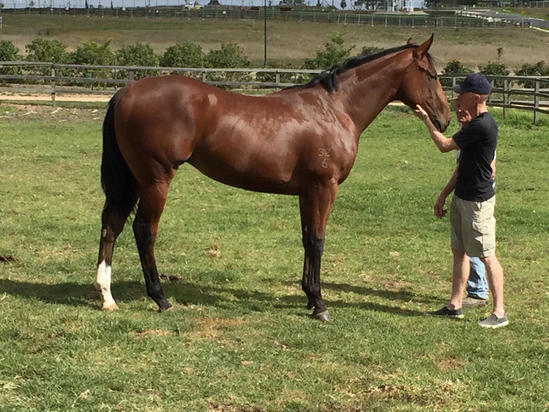 SHOOTING TO WIN (AUS) (Chestnut 2011-Stud 2015). 4 wins-2 at 2-from 1200m to 1600m, A$996,225, MRC Caulfield Guineas, Gr.1, ATC Stan Fox S., Gr.2, TAB Early Quaddie 2YO H., 2d ATC Ming Dynasty H., Gr.3, 3d ATC Golden Rose S., Gr.1, Randwick Guineas, Gr.1, 4th ATC Hobartville S., Gr.2. Brother to SW Deep Field (VRC Tab.com.au S., Gr.2). Out of SW Listen Here, a half-sister to SP Spectro Power. His oldest progeny are yearlings. Great Sky (g. by Elusive Quality). 3 wins at 1150m, 1200m, NZ$5,250, HK$2,431,575 in NZ and HK, HKJC Mercury H., Kau Sai Chau H., 2d HKJC Tung Wah Group Challenge Cup, Savile Row H., Central H., 3d HKJC Lek Yuen H., Panasonic Projector H.
Overstay (f. by Street Cry). 2 wins at 1450m, 1600m to 2017-18, 2d MRC Grand Hotel Frankston H.
Snipes (g. by Lonhro). 2 wins at 1200m, 1400m in 2017-18 in Aust. Dreamtimes (f. by Medaglia d'Oro). Winner at 1750m in Aust. Handle the Truth. Winner at 2 in 2017-18 in Aust. Alakai. 6 wins at 1000m, 1100m to 2017-18 in Aust. VIVA LA VIE (Wallenda). 7 wins from 1400m to 2100m, A$310,835, Gosford Gold Cup, Gr.3, STC Premier Express Freight P., 3d AJC Craven P., Gr.3, Clarence River JC Grafton Cup, Gr.3. CHAMPANO - LUCKY JAI (Mac.) (Noverre). 7 wins to 1500m in Aust. and Macau, Macau Guineas, L, Macau Ardross H.
ARGENTINA (Waikiki Star). 8 wins-1 at 2-from 1200m to 1650m, NZ$77,900, Timaru RC Show Gate S., 3d CJC Challenge S.H., Gr.3. MAYBE MIAMI (Iffraaj). 10 wins from 1200m to 1600m, NZ$225,973, to 2017-18, CJC Timaru S., L, Fordbaker Valuation H.
SEE THE WORLD (Danzero). 9 wins to 1300m, A$574,150, ATC PKF H., 3d ATC Sebring S., Gr.3. GLOBAL THINKING (So You Think). 3 wins-1 at 2-from 900m to 1600m, NZ$83,475, to 2017-18, Southland Guineas, L, BOP RC Gartshore H.
HANDFAST (Street Cry). 3 wins at 1250m, 1400m, A$258,785, ATC South Pacific Classic, L, Vinery Stud H.
RUSAMBO (Elusive Quality). 2 wins at 1200m, A$252,940, MVRC Sportingbet H., 3d VRC Danehill S., Gr.2. MORVEN WARRIOR (Sir Tristram). 6 wins from 1800m to 2400m, A$94,875, WATC Winter Cup, Gr.3, Happy Valley H., City Life H., 3d Geelong RC Derby Trial S., L.
TIP THE WINK (Stravinsky). 6 wins at 1200m, 1400m, NZ$165,165, Manawatu RC Totally Vets H., 3d ARC Railway H., Gr.1. Producer. SIR MIDAS (Sir Tristram). 3 wins from 1400m to 2200m, A$276,320, AJC Carbon Copy H., 2d Victoria Derby, Gr.1. RACING TO WIN (Encosta de Lago). Champion 3YO in Australia in 2006. 13 wins-3 at 2-from 1100m to 1600m, A$3,762,285, AJC Doncaster H., Gr.1, Epsom H., Gr.1, George Main S., Gr.1, All Aged S., Gr.1, STC George Ryder S., Gr.1, AJC Warwick S., Gr.2, STC Apollo S., Gr.2, Theo Marks S., Gr.2-twice, Hobartville S., Gr.2, Nivea Visage 2YO H., 2d BTC Doomben Cup, Gr.1, STC George Ryder S., Gr.1. PURREALIST (Tale of the Cat). 2 wins-1 at 2-at 1200m, 1400m, A$200,650, MRC Caulfield Guineas Prelude, Gr.3, Canonise 2YO H., 2d SAJC Jansz S., Gr.3, 3d VRC Danehill S., Gr.3. Sire.